Finally! Something that's been spotted on shelves recently and apparently pretty buzzworthy showed up at one of my local Target stores. And for that, I'm quite grateful, because these things are delicious. A few years back, I looked at Archer Farms Peanut Butter Fudge Ice Cream—a close relative of these ice cream bites. To put it bluntly, I was underwhelmed with the quality of that ice cream. But this time, Archer Farms set the bar a little higher in terms of taste and quality. This product is a peanut-lover's dream. The chocolate shell isn't bad either, but peanut butter ice cream, peanut butter swirl, and dry roasted peanut bits steal the show here. The ice cream is rich and smooth, and would make a great dessert all by itself. The peanut bits in the shell add some crunchiness and complexity to the texture of the product, as do the peanut butter ribbons—although I wish there were more of them. 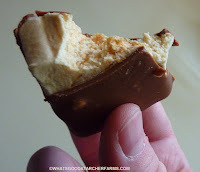 In fact, that's my biggest complaint: I'd ask for thicker swaths of peanut butter in the core of these tasty bites. I'd also aim for a smaller size. I'm not sure who's taking the "bites" here, but he or she obviously has a huge mouth. Each piece is somewhere between the size of an ice cream bonbon and a Klondike Bar. They wound up being 3-4 bites each for me. Also, I'm not sure if it was entirely necessary to individually wrap each bite, but it might have helped a bit in the portion control department—important when you're looking at 6g of saturated fat in a single piece. I know, I know, it's a dessert. You've got to live every once in a while. But still. Also wasn't particularly happy to see carrageenan on the ingredients list—a substance I've become wary of lately. 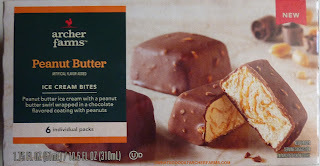 All things considered, these are worth a purchase, particularly if you love peanut butter like I do. There are a few other flavors of these ice cream bites popping up on Target's shelves. I'll try to take a look at those soon, too. Leave a comment if you've tried any of them. I give these ice cream bites 9 out of 10 stars.